Kirigalpoththa is Sri Lanka’s second highest mountain. I learnt that from Sri Lankan hiking blog with the same name that I introduced a while back. Along with giving boots on the trail accounts of hiking in Sri Lanka Kirigalpoththa the blogger tends to put up photos of some stunning places in Sri Lanka that awe less fortunate desk bound serfs Cerno. Understandably after a hard day on the trail he can’t be expected to mark all these places on Google Earth. So I thought I’ll try my hand at it since I’ve done this sort of thing before. To start with here’s a screen grab of Kirigalpoththa mountain from Google Earth. It doesn’t have a lot of high resolution detail. 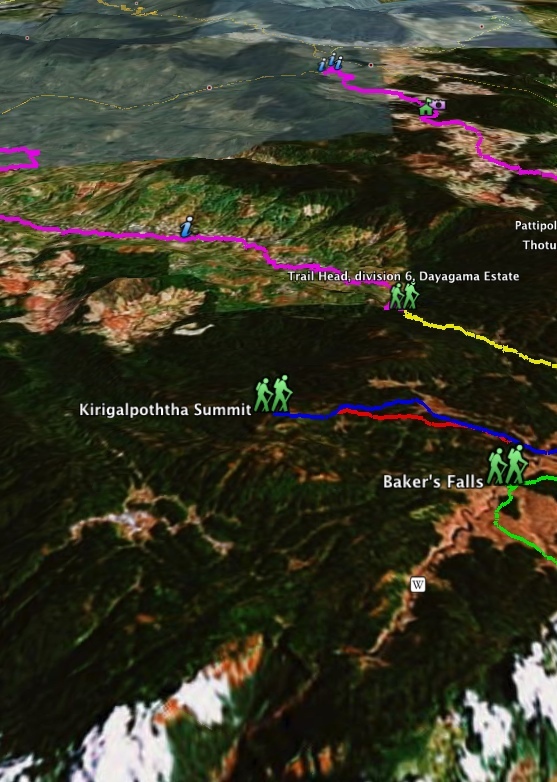 However, the Google Earth location file (.kmz) I found also includes a details of the trail to climb Kirigalpoththa mountain. The last update date on http://www.lakdasun.com (where I got the file) is listed as February 2, 2009 so I’m not sure how current those details are. I’ll leave it to Kirigalpoththa to clarify. Have a good weekend. May you have the fortune to go to places like these and come back safe and happy to tell use about it. I find GPS is too much for Sri Lankan hiking as the distances are not that great, beside you lose the excitement of getting lost..ha..ha… but I might use a GPS if I ever get a chance to do PCT! That getting lost story of yours gave me the shivers! Muchos gracias for the heads up on the RSS problem. I noticed it on other blogs too. No idea why that’s happening. Could be a wordpress.com thing. Usually these things sort themselves out (fingers crossed). I too noticed what Chavie pointed out..that must have been a minor glitch during the time you posted it. Any idea when Google going to improve resolution in some of the areas in Sri Lanka, including Kirigalpoththa area? Thank you Cerno, my first visit to your blog (Came via Kirigalpoththa 🙂 . I sure do hope Google will update the sat images of Sri Lanka. (They do exist). Thank you for the fine blog, and I just began to read! Than you 🙂 For more hiking info head over to Kirigalpoththa’s blog. As per the Wild life Dept guidelines you are not allowed to camp in Kirigalpoththa. But you can camp in designated areas in Horton Plains. There are 3 camp sites which can be reserved from Dept. of WildLife Conservation. They are numbered 1-3. Asked for the site near Chimney Pool. For me that is the best! Lal, check out http://www.kirigalpoththa.blogspot.com which would be a good starting point for the kind of info you are looking for.